Have you procrastinated with your tax planning strategies or retirement planning? There are a still a few tricks to help you change your 2018 tax situation. Before you file your 2018 taxes consider a few last minute planning ideas to Level Up your financial planning situation and possibly increase your refund amount. Did you know you can actually make retirement account contributions for the prior year? You have until the tax filing deadline April 15th, 2019. Your income level may prohibit you to make certain contributions. To see if you qualify, or not you should review the image below which contains the contribution and phase out (when you are no longer allowed to make normal contributions) limits. Deductible contributions to a Traditional IRA account will allow you to reduce your tax liability for the year your contribution is applied. Deductible contributions to a Traditional IRA account allow your investments to grow tax-free, but when you withdraw your funds in retirement (59.5 age limit for normal withdrawals without penalty) you will have to report your withdrawal as ordinary income. If you are allowed to make deductible contributions for 2018, then you or your spouse can reduce your taxable income by contributing to a Traditional IRA account for 2018. Be sure to notify the company that you establish your account with that you are making contributions for the prior year. 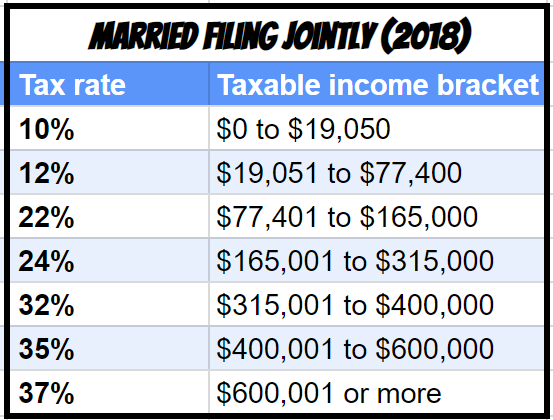 A couple married filing jointly is in the 22% bracket. If they avoid the phase-out limitations, then they may be eligible to contribute up to $5,500 each (contribution limits increased for 2019). If they both max out their contributions the total is $11,000 and reduces their income by that amount. You can fund the tax reduction by multiplying their contribution by the rate they would have had to pay taxes at if they did not reduce their income, 22%. This allows them to reduce their tax liability for 2018 by $2,420! There are potentially two ways to make tax neutral retirement account contributions for 2018. Roth contributions will not reduce your tax liability for 2018 unless your income level allows you to qualify for Saver’s Tax Credit (Adjusted Gross Income Limits: $32,000 single; $64,000 married filing jointly). Instead, your contributions are allowed to grow tax-free and are also withdrawn tax-free when you retire. People decide to make Roth contributions instead of Traditional IRA contributions when they feel that they will be in a higher income tax bracket in the future. They would prefer to pay taxes at lower rates and withdraw their Roth account contributions in retirement tax-free when they may have higher tax rates. Roth accounts make the most sense the further apart you expect your current tax rate to be from future tax rates at withdrawal. 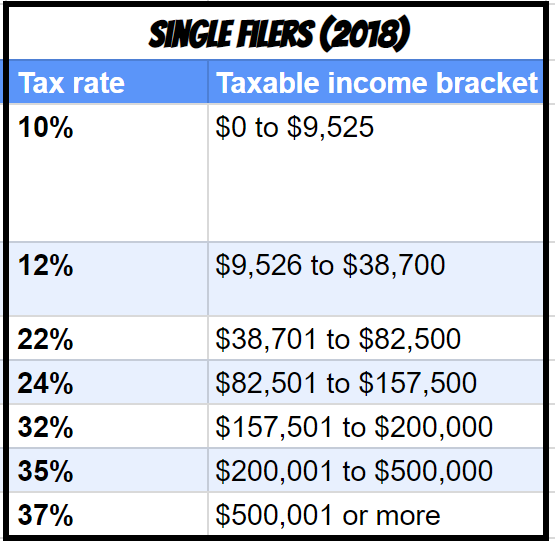 A young (23 year old) professional, early in their career falls into the 12% tax bracket for 2018. This individual plans to grow their career significantly and expects to be earning income that would project them to be in the 24% income bracket for a majority of their career. They will likely increase their lifestyle and require similar income in retirement. Paying 12% in taxes now may feel like nothing compared to what they will be paying in the future. 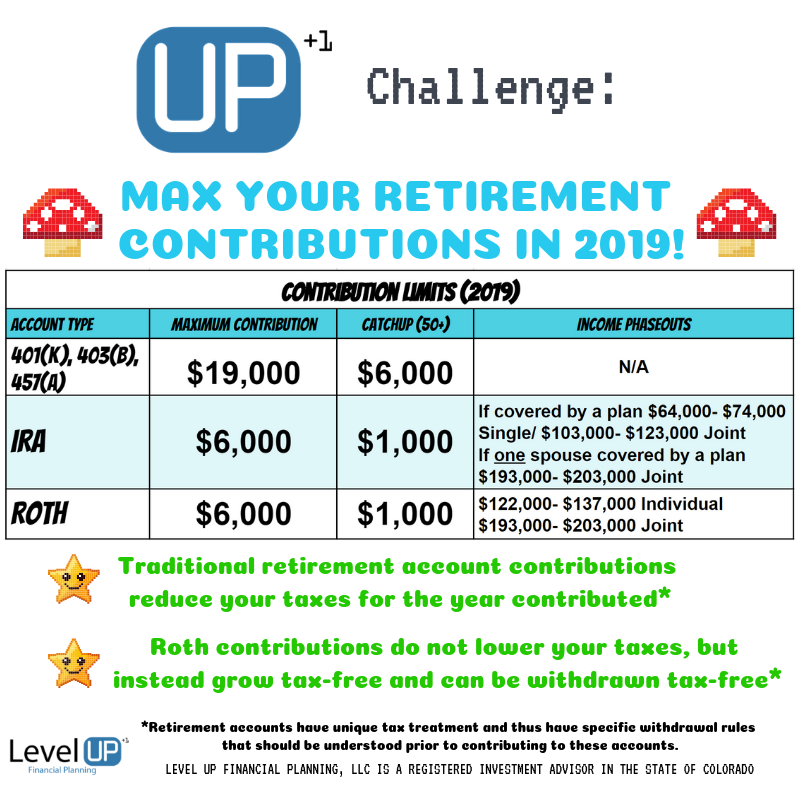 Even if they only make maximum contributions for 3-years and then transition to a Traditional 401(k) or Traditional IRA contributions after that, using an *assumption that this account grows at 6% until their retirement at 66 years old, their balance would grow to $160,258*. Not only is it remarkable what $16,500 could potentially do with time and compounded growth, but since that growth occurred in a Roth account it is all tax-free. A quick recap of tax trade-off: Paid 12% on the income that was used to contribute to the ROTH account for three years, which would total $1,980 in taxes. The final amount of $160,258 from the example is accessible tax-free. If this individual would have chosen to save the $1,980 on taxes and contribute to a Traditional IRA if they withdraw funds while in the 24% income bracket the full amount would be taxable and they could end up paying $38,461 in taxes! If your income level phases you out of both Roth and Traditional IRA contributions, then you may look into making a non-deductible IRA contribution. This will not reduce your tax liability but may allow you more advanced tax strategies. This is a pretty advanced strategy, which I have yet to create my own strategy guide for. Here is a link to one of the thought leaders in financial planning that is more than thorough in addressing the possible uses and benefits of non-deductible IRA contributions. If you have trouble making heads or tales of it, please reach out to me and tell me to create a more non-financial planner worded strategy guide and that could be the fire I need to crank one out for everyone. HSA contributions work like Traditional IRA contributions where they reduce your taxable income. HSAs allow you even greater tax benefits than retirement accounts. Not only do they reduce your taxable income and grow tax-free, but are also withdrawn tax-free when used for qualified medical expenses. You need to have a high deductible health insurance plan that qualifies you for an HSA. Sometimes people freak out about the high deductibles and max out of pocket limits of high deductible health plans, but if you max out your HSA each year, this tax savings definitely helps even the playing field with other lower deductible plans. The higher the tax bracket you fall in the more beneficial it will be to make HSA contributions. A huge mistake many make who are eligible for HSA contributions is that they have medical expenses that they pay out of pocket and do not use the tax savings benefit of reimbursing themselves. If you had qualified medical expenses in 2018 that you already paid, you should contribute to your HSA and then immediately withdraw the funds to reimburse yourself. There is no mandatory period that your contributions need to stay in the account. My wife and I have a High Deductible Health Plan through her employer, which allows us to make HSA contributions. We had our daughter last week and are going to have some serious medical expenses to pay. We can actually make contributions prior to the tax deadline and immediately (financial institution may put a short hold on funds) withdraw them to reimburse ourselves. These contributions are for 2018, but we are reimbursing ourselves for a 2019 expense, though this still works to reimburse yourself for 2018 expenses that you already paid! Employer-provided 401(k) plans are great. Not only are your contribution limits significantly higher than Traditional IRA and Roth accounts, but your employer may provide free money in the form of Employer Matching or Profit Sharing. Unfortunately, employer-provided 401(k)s do not allow you to make previous year contributions. If you are kicking yourself right now, you should check out “Looking Ahead to 2019” taxes below for a few ideas. You may be wondering if I have a magic wand to help you fund these accounts. Especially because besides the HSA, where you can quickly withdraw the funds you contribute to reimburse yourself for medical expenses you have already paid, you may not be in a position to throw a bunch of money into one of these account types. Do you have excess savings? Do you have non-retirement assets (for many of my clients this is employer stock)? Can you use a portion of your refund? Next, evaluate to what level you can reasonably contribute to these accounts knowing that you cannot access them until retirement or you have qualified medical expenses for the HSA. Anything you are able to contribute without putting you in a bind is going to Level Up your financial situation. Feel like you could have done better if you planned ahead? Reach out to me or at the very least read the “Looking Ahead to 2019 Taxes” section below. Fund your account prior to the tax filing deadline of April 15th, 2019. Whenever you make Traditional IRA, ROTH, or HSA contributions companies are not required to generate tax documentation of those contributions until May, which is after the tax deadline. All you have to do is report it to your tax professional or in your tax software. In May you will receive the tax form and you can store this with your tax documentation for future reference. The IRS increased contribution limits for retirement accounts. Check them out below. If you feel that you should be able to do better than you have been or maybe your financial life changed substantially this year, you really should create a game plan. It could be as simple as automating your contributions. Rather than procrastinating and waiting until 2020 to do some last minute tax planning, you may want to adjust your monthly cash flow and begin to fund the accounts on a monthly basis. Not only will this increase the possibility that you will save the anticipated amount, slightly reducing your paycheck may force you to do some soul searching with your spending habits. After-all, I have found that most people are really good at living paycheck to paycheck. This holds true even if they have to live off slightly less income because most people adjust and do not miss the funds and prioritize the items that are most important to them while cutting off some excessive less valuable items.